Corset in new CU shape with extra room for ribs and big compression on waist which gives dramatic curve to any figure. This prevents the pressure on the ribs and hip bones and creates amazing hourglass shape corset. During wearing this corset you will never reach the point where you experience pain, or be so tight that you cannot breathe properly. Every corset is lined with 100% cotton lining and have a modesty panel. All of of Restyle hourglass corsets have waist tape, which serves as protection for the seams. 14 spiral bones provide comfort and fit perfectly to the body, especially in curved areas. Those bones will not deform even after long period of wearing a corset. On front there are flat bones with four, decorative swing hooks locks. On the back there are four flat, steel bones which provide additional support for the binding. Because of them corset will stay in right place. 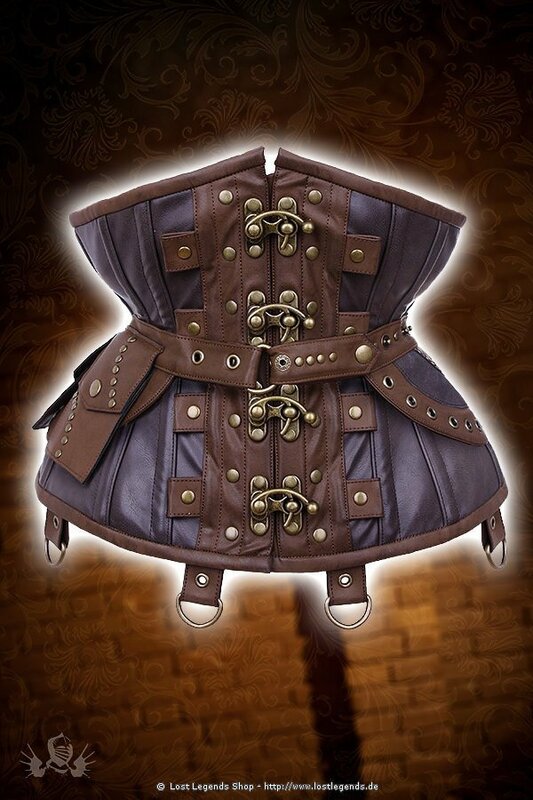 Every corset comes with detachable belt with two pockets and decorative flap. Belt is entirely covered with snaps because of that is totally adjustable. Thanks to the belt you can change the look of the corset very fast! There are also straps with rivets and D-rings, so you can attach other adornments such as chains or pocket watches. Obermaterial: 100% Polyester, Innenfutter: 100% Baumwolle.